So many jobs pay little, expect employees to work long hours, and offer little upward mobility for you to advance your career. The only solution if you’re stuck in a frustrating job? A new career in a booming industry, like computer programming. Computer programming is a quickly growing field with plenty of opportunities – and the average starting salary of a programmer is $54,183 according to PayScale¹. If you’d like to become a programmer, all you need is an education in coding. Thanks to online coding boot camps and other easy education options, you can learn everything you need to become a programmer today in as little as 8 weeks. 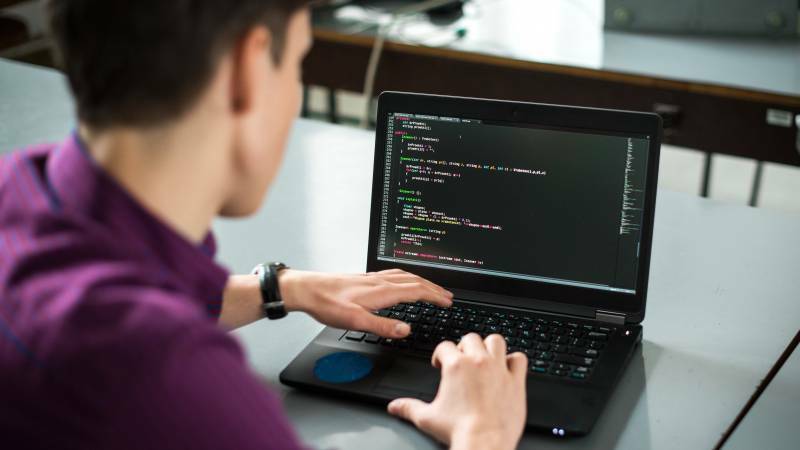 Here are the top reasons more people are choosing coding schools to become programmers in today’s job market. Job flexibility is one of the perks computer programmers enjoy. No matter the company you work for, computer programmers are often freelancers – which means you get to set your own hours and choose your work environment. It’s very common for programmers to work remotely, giving you the freedom and flexibility to work from anywhere at any time, as long as you have internet access. Thanks to today’s cloud-based work platforms, you can work as a team member without having to be physically present in an office. As long as your job is finished on time and within budget, many employers don’t care about your physical location or when you work. This means you can set your workdays up however you’d like without worrying about being in the office from 9 to 5. Computer programming jobs are becoming increasingly available, which means programmers are in high demand. At any given time, there are as many as one million or more jobs advertised that require skills in computer programming or coding, Rasmussen College writes². And this trend is only going to continue into the future. Technology is continually changing, and with computers an integral part of every business, every industry, programmers are critical members of any company’s team. Software Application Developer: Software developers create and enhance applications for computers and mobile devices. Web Developer: Web developers are responsible for building websites of all kinds. Database Administrator: A database administrator is responsible for securing, storing, and organizing large amounts of data. Software Quality Assurance Engineer: A quality assurance engineer designs tests, documents defects, and compiles user manuals for new software. Network System Administrator: A network system administrator oversees a computer network and prevents disasters by backing up critical data. Finding a job is easy once you’re educated in coding and have some experience putting coding to use. With so many job openings and opportunities around the world, you won’t have any trouble finding a job. Another advantage to becoming a computer programmer is the independence it provides. With your coding skills, you’ll be in demand – and you’ll have the opportunity to work independent of a company. You can even start your own company, offering services to different businesses and building a team of programmers to lead. You can create your own software, make your own apps, become a web designer who takes on clients, or work on contract projects whenever you’d like. Additionally, there’s independence in how much you can earn. Programmers can also make a bit of extra money by picking up side jobs. The gig economy is huge today, and with a quick search online you’ll discover just how many people are willing to pay for short-term programming help. To make some extra cash, you can use gig apps or sites to pick up quick projects whenever you need to. There are many advantages to becoming a computer programmer. The industry is only expected to grow, and that means programmers are going to continue to be in high demand. Thanks to the flexibility, independence, and wide availability of jobs, you can have a career you truly enjoy as a programmer. There’s only one thing you need to get started: coding knowledge and experience. If you’re new to computer coding, there are plenty of online options to help you get started. You can try a boot camp to learn skills quickly, or take college-level courses online. Many courses are free to try out, so you can see if coding is something you’d like to explore as a career or as an education. It’ll certainly pay off in the long run when you enjoy the income and the perks of working as a programmer. Interested in learning coding? Start a search today.